Fresh snow finally fell in the new year at Vail and Beaver Creek, which had both been relatively dry since a Christmas storm 12 days ago. Vail reported 9 inches of new snow Sunday morning, while Beaver Creek chimed in with six new. And more is in the forecast for later this week. The Vail snow stake on Sunday morning. “Snow began to fall on Saturday midday and afternoon, continued on Saturday night, and is just about over now early on Sunday morning. 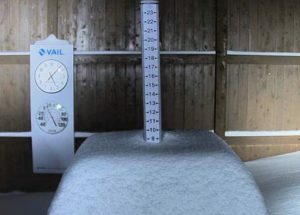 Accumulations across Colorado averaged 3-7 inches with the winners getting 8-11 inches (Vail, Crested Butte, Snowmass, Aspen Highlands),” Opensnow.com meteorologist Joel Gratz reported Sunday morning. Snow was continuing to fall fairly steadily at 8:30 a.m., Sunday, in EagleVail. That’s very good news for a region now experiencing moderate drought conditions, according to the U.S. Drought Monitor. Vail has about a third of its average annual snowfall, and needs a lot more snow this week to even begin to think of opening its legendary Back Bowls. During the drought season of 2011-12, Vail did not open the Back Bowls until Jan. 15. Beyond ski conditions, water officials across Colorado are starting to express concern that ongoing drought conditions will impact stream flows this spring and summer. The Denver Post recently reported the state’s snow pack is the worst it’s been at this point in the season in more than 30 years. Even significant winter and spring storms the rest of the season might not allow the state to catch up to average snow pack conditions. Of course, anyone who’s lived in the state’s high country for any amount of times knows that the snow can start coming in waves and not stop until well into the spring and even early summer. UPDATE: Forecasters are calling for up to a foot of new snow between Wednesday afternoon and Friday morning across most of the state, then more snow next week. Go to Opensnow.com for the latest.